Coral Coast Judo Club Inc.
First term commences on Wednesday the 30/01/19 at 6pm for juniors and 7pm for seniors. See you all back then. Congratulations to Gwyneth Dowell and Hunta Langley on being selected to attend the 2019 Futures Summer Camp held at the Combat Centre, Australian Institute of Sport in Canberra. Only 50 attendees Australia wide were selected. Camp provided an introduction in to the cadet level of judo competitions. As we are coming into the summer months and heat will become an issue in training, please remember to bring sufficient fluids/hydration to the dojo when training. A big thank you to Nicola Falstein and our uniform design committee for the excellent work in obtaining sponsorship for and the design of our new club shirts. Delivery is expected at the end of November before break up. Sizes, cost and orders can be obtained from Nicola at training. Tiny tots training has been suspended until further notice. Anticipated to return to normal in 2019. Congratulations to Dan Albury and Jeff Anderson on being awarded the rank of Shodan. Sebastian Temesi and Andreas Schmidt also completed the grading and were awarded promotion to Ni-Dan. Congratulations to all our junior and senior judokas on the outstanding results achieved at the 2018 Australian National Championships held on the Gold Coast from 7-11 June 2018. Gold medals and current Australian Champions: Sebastian Temesi, Andy Schmidt, Mo Cook and Rob McIntosh. The club had the pleasure of hosting Carolin Boehme from SFV Holthusen Judo Club in northern Germany for one week. Boehme is currently travelling Australia competing in Judo competitions and attending local clubs to gain Australian experience. Her wealth of knowledge was of a great assistance to the club particularly in training with our senior girls. Boehme also gained a lot of practical competion advice after training with both Andy Schmidt and Sebastian Temesi. Carolin has travelled from Melbourne up the east coast and is now heading inland to Alice Springs and on to Adelaide and Perth. The club wishes Carolin all the best with her Australian adventure. Head NQ State Coach Andreas Schmidt has finalised selections for competitors attending the National Championships on the Gold Coast in June 2018. Thirteen players from Coral Coast will attend the championship as part of the 109 strong Queensland contingent. Our Junior team consists of Tori Baird, Gwenyth Dowell, Price Duncan, Hunta Langley, Nanami Anderson, Julie Anderson, Nikita Mcdonald and ALex McDonald. Senior team members are Andreas Schmidt, Sebastian Temesi, Mo Cook, Rob McIntosh and David Russell. Sebastian Temesi continues his dominant form with his third Oceania Championship. Temesi won all his fights on the way to winning gold at the Oceania Championships in New Caledonia. Sebastian has returned to Coral Coast Judo Club with a hectic training schedule in the lead up to the National Championships in June on the Gold Coat. Sebastian Temesi after sensational consecutive Ippon wins through the ACT, Victorian and Qld International Opens has been confirmed as the only senior Qld Mens representative on the Australian Team heading to the Oceanias in April. Sebastian is continuing his heavy training schedule with a number of upcoming competitions in the lead up to the Nationals. First up after the Oceania,s is the Chinese Grand Prix in Hohhot, China is the first Olympic selection event for Tokyo 2020. Good luck Seb!! Congratulations to all our competitors who competed in the Qld International Open on the Gold Coast in March. Our senior and junior teams proved to be highly competitive with a number of gold silver and bronze medals returning to the Club. Special congratulations to Sebastian Temesi and Andreas Schmidt for their outstanding results and gold medals. 2018 promises to be a stellar year for Coral Coast Judo Club if the results of 2017 are anything to go by. 2017 saw the club being recognised as the largest judo club in Queensland for the second year running. Every junior judoka was successful in grading at least twice throughout the year and two of our senior members, Jeff Anderson and Dan Albury, received their Club Dan (Black Belt) grading. The competitive results of the club were outstanding with two players attending the World Championships in Hungary, one Oceania Champion, 3 Australian senior men's champions, 5 junior state champions and medals for every competitor who attended the FNQ inter-club competitions. A generous grant from the Salsa Sorenson Foundation saw our training mat area increased to accommodate our growing number of junior judoka. Eight coaches were accredited with the National Coaching Accreditation Scheme and the head coach of the club, Andreas Schmidt was named as the State Coach for FNQ. President Jeff Anderson said, "We are looking to continue the hard work of the committee to grow judo in not only our club but also FNQ. We want FNQ judo to continue to be a force on the Australian Judo stage." The club is starting to fund raise to send a team to the Gold Coast in March 2018. Further updates to be supplied as they become available. Coral Coast Judo Club won the bronze medal for the team championships at Innisfail. The effort of our club was rewarded with 5 gold medals allowing our club to win bronze narrowly behind the Innisfail and Northern Pennisula Clubs. Well done to all the parents, coaches and team members for their efforts in representing the club at this level. Coral Coast Judo Club attended the State Judo Championships held at Innisfail on 30/9 - 1/10/17. Our club sent a team of 15 judoka to compete against a field of over 120 competitors. The club performed to a very high standard bagging a total of 5 gold, 7 silver, and 6 bronze medals. Gold medallists and State Champions are Hunta Langley, Jorja Tudehope, Oscar Dowell, Lilly Schmidt and Tori Baird. Silver medallists were Matilda McDonald, Nikita McDonald, Holly Dowell, Oliver Tudehope, Julie Anderson, Gwyneth Dowell and Lincoln McGrath. Bronze was awarded to Nikita McDonald, Nanami Anderson,Solomon McGrath and Lachlan Wotton. Lilly Schmidt earned the 'Judoka of the Day' Award recognising outstanding judo and sportsmanship demonstrated throughout the competition. FNQ Assistant State Coach Andreas Schmidt felt "the results achieved at this state level competition show regional clubs can perform at the highest levels with success." Club President, Jeff Anderson also thanked the Salsa Sorenson Foundation for the grant allowing the purchase of mats for training in the lead up to this years competition. "This grant allowed our judoka, regardless of medals won, to be considered winners because they are participating in and enjoying sport." For the first time in modern judo history, three senior mens Australian Judo Champions are from the same club. AND, they are from Mossman! Coral Coast Judo Club is celebrating the achievements of one junior and three senior Judo players who attended the Australian National Judo Championships held on the Gold Coast. Over 900 players attended the three day competition aiming to be crowned Australian Champions. The Nationals are a premiere selection event for participation in the World Championships to be held this year in Hungary. Nanami Anderson, appearing at her first Nationals, was beaten by the gold medalist in her first fight and then narrowly lost to the bronze medalist in the junior girls division. Coach Andy Schmidt described her efforts "as a tremendous effort and a learning curve for future success in the years to come." Three gold medals were won by senior players, the first time in modern Australian history for all players to come from the same club. Andy Schmidt won gold in the under 81kg division,moving into the finals and winning the fight in under a minute. Sebastian Temesi continued his great form from winning the Oceania Title with concise wins in the under 90kg division. David Russell conquered the under 100kg division in his return to competition. Club president Jeff Anderson said "it is a testament to the level of training conducted at a club outside of the major metropolitan areas." Both Temesi and Russell are now waiting anxiously to see if their efforts have been enough to be selected for the Australian team travelling to the World Championships in late August. CAIRNS OPEN/GREAT BARRIER REEF MASTERS GAMES. Great Barrier Reef Masters Games were held at Northern Beaches Judo Club, Cairns and attracted over 50 players from Australia and Japan. Two senior men from Coral Coast Judo competed. Andy Schmidt received silver in the middle weight division overall, silver in the open ground work and gold in his age division for ground work and gold in the teams event of Australia -v- Japan. Rob McIntosh won bronze in the heavyweight division, gold in age groundwork division and placed fourth in open ground work division. Next week I will have the results of a very successful National Judo Championship campaign with 3 of our senior men winning gold medals. The Nationals were held on the Gold Coast and attracted 900 competitors. This is the premiere competition event in Australia with results being critical to selection for the World Championships to be held in Hungary in September this year. No other judo club in Australia has three current Australian Mens Champions as members. Again a photo and more info next week. Just a reminder there is no training scheduled over the school holidays for juniors or tiny tots. First training session back after the holidays is Wednesday 19/04/17. Have a great holiday. A big thank-you to the generosity of Cairns Hardware for the donation of an industrial fan for use at the dojo. Given the recent heat it is a welcome addition to the Club. Its great to see a local business supporting a local sporting club. Thanks again to Joanne Ablett, store manager of Mossman Hardware for her support of our sponsorship application. 14 junior judoka attended the competition held at Northern Beach Judo Club on Saturday 18/3/17. Teams from Coral Coast, Cairns and Innisfail attended that competition with 40 judoka competing. Our team won seven gold, six silver and one bronze. Well done to all our players for their outstanding efforts on the day. In particular, congratulations to Brian Harris and Matilda McDonald for their over 7 minute epic battle on the mat. Either one could have won, but the quality and commitment shown by both players to their contest was the best of the day. Mayor Julia Leu and Deputy Mayor Abigail Noli presented the Club with the Judo Federation of Australia's Award for the Best New Club Initiative for 2016. The Club would like to thank the Douglas Shire Council for their continuing support. Fielding a team of six across junior and senior divisions, Coral Coast was able to bring home 6 medals from the Queensland International Open held on the Gold Coast on 4.3.17. Sebastian Temesi (Silver), David Russell (Silver) and Mo Cook (Bronze) all competed in the men's divisions and did the club proud. Our juniors, Nanami Anderson (Bronze), Tori Baird (Bronze) and Nikita McDonald (Silver) achieved personal bests. The Open attracted over 400 competitors from Australia, New Zealand, Japan and the United Kingdom. The Club is pleased to announce that it has won the Best New Club Initiative for 2016 with its "Get a Grip" program run in conjunction with a grant from the Douglas Shire Council. Scholarships were awarded to school students (nominated through their schools) within the Shire, who then received training and grading through the Club. Our club has retained high numbers from this program and has led to two further awards. Largest Club in Qld and third highest in Australia for female participation in sport. Well done to the committees for their efforts in these awards. Sebastian continues his winning form with a Gold Medal in the Act International Open. Seb's next competition is the Qld International Open in March 2017. 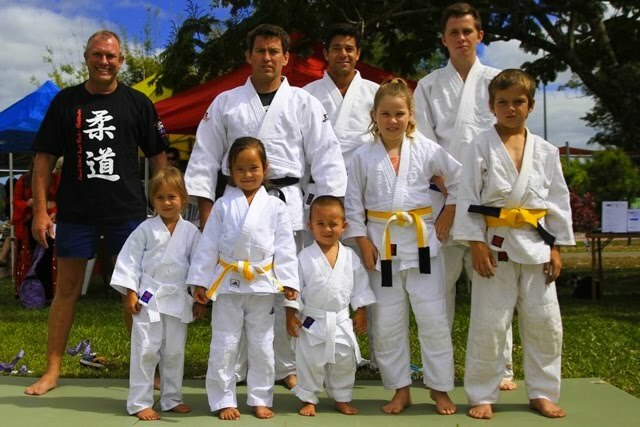 Coral Coast Judo Club has received a two star award from the Aus Judo StarClub Program. Clubs are ranked on their membership numbers over the previous year. It is pleasing to see the club move into the program with a two star award (for clubs over 50 members but under 75 members). Our membership numbers currently rank us as the number two club in Queensland for membership numbers. Not bad for a regional club in any state! Our goal is to increase the 2017 award to three stars (75 - 100 members). Coral Coast Judo Club was pleased to host Paul Nelson, President of the JFAQ at a training camp over the weekend of the 22nd and 23rd of October, 2016. The event commenced on Friday night with Paul Nelson providing the NCAS course for 8 coaches. Saturday saw coaches, Sebastian Temesi (current National and Oceanic <90kg champion) and Andreas Schmidt providing developmental training and assistance to the 32 junior and 16 senior judoka who attended. Judoka from Cairns, Innisfail and Townsville joined our locals for an informative and demanding two days of judo. The Club would like to thank Paul for providing the NCAS training, Andy and Sebastian for the program and all the volunteers who made the training camp a success. Salsa Sorensen Association has donated $5000 to the Club. The generous donation from this local charitable association will enable our Club to increase its training mat area. This increase will allow the Club to hold training weekends for the FNQ Region and help our Club with our growing membership base. 25/06/2016 saw the gathering of 147 Judoka at the Cairns Beaches Judo Club, Yorkeys Knob, Cairns for the RACQ Nth Qld Games. Boasting the largest participant numbers of all sports at the Games, Judoka travelled from as far afield as Bamaga, Mt Isa, Innisfail, Townsville, Coffs Harbour and Adelaide. Coral Coast Judo Club had 17 competitors across the junior and senior divisions. Our medal count was 4 gold, 6 silver, 2 bronze and 7 fourth place medals. Douglas Shire Council provided funding for Coral Coast Judo's scholarship program "Get a Grip". This funding allowed the club to provide 10 scholarships to students from all schools within the Douglas Shire. Successful applicants were provided with a terms membership and instruction followed by a grading in which all students were successfully graded. The scholarship winners have continued training with the club and are now on track for their next grading. The grant also provided the club with 10 come and try blue judogi's. Mossman Health and Wellbeing Expo.